Study up for the ACT or SAT. The Badgerlink resource will require library bar code/pin to access from home. After getting into LearningExpress, you must register for an account. Take the ACT or SAT. Use these links to register. Research university, technical colleges, and even out-of-state schools. Use College Lists Wiki to learn about colleges all over the country. Complete the FAFSA-the application for financial aid. Males register for selective services upon turning 18. Apply for college. 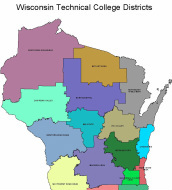 Applications available online for Wisconsin universities & technical colleges. Register for placement testing for the university system.